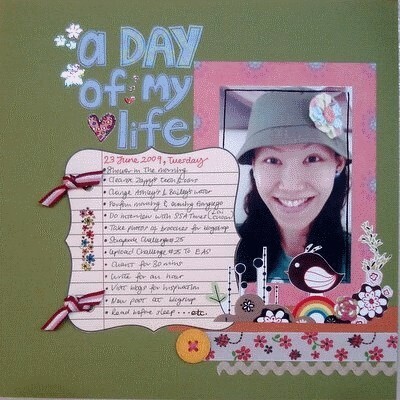 “A Day of My Life” is a casual and meaningful scrapbooking idea. You just have to record down what you’ve done in a day – the activities, the major happenings and the little details of that particular day. You can choose to focus on any day, but preferably one that truly represents what you’re normally doing during this stage of your life. It could be the most mundane day or it could be one packed with activities and chaos if that’s what happening in your life right now. Years later, as your life evolves and changes, you can look back and notice the differences in your present and earlier lifestyle. 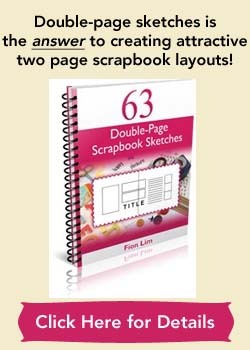 For me, I chose a usual weekday Tuesday to scrapbook. Other than an interview I had to give and some photos I had to take for my new mini blogshop, the rest of the activities were pretty standard for a Tuesday. :-) I wonder how my daily activities will change in a year’s or five years’ time. 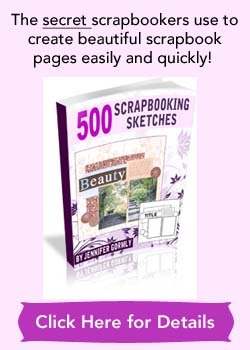 Enjoy and have fun with this idea! Stock Vector Illustration Credits – Sweet Garden Bord by Vectorstock from Shutterstock.com. Supplies used: Cardstocks – Bazzill Basics; Patterned papers – Brenda Pinnick Designs “Paper Confections”; Journal paper – Teresa Collins “Journal-it – Journal Notes”; All ribbons – from stash; Rub-ons – Daiso Japan; Yellow felt button – Daiso Japan; Photo black pen – Zig Photo Signature; Black pens – Uni-Pin Fine Line, Zig Memory System “Millennium”; Red pen – Zig Memory System “Fine & Chisel”; Pink floss – DMC.